Gummis are rubbery, blob like beings with no fixed shape. They can extrude and resorb pseudopod limbs as needed. On average slightly less massive than Humans, Gummis have significantly greater variation is size. Their compact form is very muscular although they tend to be slow. Their skin is rubbery but covered with a short velvety fur that serves as insulation and sensors. Lumpy skin nodules remain bare - these may open up into suckers or contain eyes - but retain the skin's rubbery flexibility and texture. Gummis are named for their resemblance to a huge wad of chewed up gum. They are typically colored in drab shades of red, orange, brown, or yellow. Gummis usually have several antenna-like sensory projections which feel ahead of them and many contain eyes. When moving they use multiple stubby leg-like pseudopods to hold themselves above the ground. Gummis smell slightly of mint and oregano. Their breathing gives their bodies a slight pulsation. Gummis are actually tightly integrated colonial animals. Individual units called zooids range from the size of a pea to about the size of a Human thumb. Each zooid contains its own organs - a nervous system, digestive system, excretory systems, and musculature. Zooids will specialize for different functions. Some form the outer skin, some make up the muscular and hydrostatic skeletal system, others carry out most of the digestion, and yet others are pumps to distribute oxygen, food, or waste or are sections of tube through which these fluids flow. Slow pulsations also act to pump air and fluids through these tubes. Zooids latch together strongly. When a Gummi changes shape, its zooids detach from their current positions and flow through the vascular network to new locations. The Gummi brain is distributed throughout their body. Ganglion zooids are responsible for information processing and memory, and communicate via biological fiber-optic cables with other ganglia for a body-wide information processing network which is sentient and sapient. The use of fiber-optics makes them vulnerable to lasers, which can stun and disorient the Gummi if it penetrates its skin. Despite this vulnerability to lasers, Gummis are very resilient to most other forms of injury. Redundant organs mean that they have no single point of failure to be destoryed by an injury, and re-configurable tubes that distribute their bodily fluids can pinch shut and re-route flow around injured sites. Destroyed zooids can be replaced with new ones in about a week. Nevertheless, too much injury will disrupt a Gummi's mind. The individual zooids may survive severe trauma and reform a body, but the consciousness that emerges will not be the same if the mind was completely scrambled. Such individuals may retain echos of memory or personality of their previous selves. At any time, Gummis will have several dozen eyes arranged around their body, although they will generally be more concentrated around the "forward" end. Gummi eyes are better at seeing in dim light than those of Humans, but they are less able to pick out fine details or spot non-moving objects. Nevertheless, they can form well-resolved images and eyesight is used as a way of telling the Gummi of the broader details of the world around it. The velvety hairs that cover a Gummi are very sensitive to stimuli. They allow a hyper-sensitive sense of touch and pick up on vibrations in the air and ground to alert the Gummi to nearby objects and moving things. Gummis typically have several pseudopod feelers projecting in "front" of them that wave around and let the Gummi feel what is out there. Sometimes eye zooids will be set on the end of these feelers. Special hearing zooids filter and amplify sounds to where internal sensory hairs can detect them. This allows a Gummi to hear. Gummi hearing is sensitive across roughly the same range as that of Humans, but can detect slightly lower frequencies as well. The sucker-nodule zooids that stud a Gummi's skin are also very sensitive to taste and smell. Essentially, a Gummi tastes and smells everything it touches. The suckers also pick up on airborne odors, as do sensory zooids lining the air tubes. Smell is the primary sense that Gummis use to identify objects and each other. A sample of Gummi script, from the epic of Groolor and Naogliioo. Gummis can communicate emotions and social signals with odors and scent markings, and body posture can convey basic intents, but to transmit complex ideas they use language. A Gummi's voice sounds like a throbbing hum or thrum overlaid by wheazy whistles. When speaking, the Gummi's body pulsates to pump air through their vocal instruments. The sounds of native Gummi language cannot be transcribed by any alphabet or syllabary intended for Human tongues. Hence, Humans had to come up with their own words for the Gummi species, homeworld, and other objects that the Gummis already had names for. However, with practice, Gummis can learn to mimic Human voices to some extent and vice versa, although Humans have trouble speaking native Gummi languages because they use several different sounds at the same time. To get around this, Gummis have developed a trade tongue that many other species can speak. Gummi vision is not as sensitive as that of a Human, so Gummis use their sense of touch to read fine print. Visual writing and symbols are still used for signs and other markings meant to be noticed at a distance, although these tend to use very simple shapes and colors because of the Gummis' lower resolution eyesight. Gummis also make extensive use of odors for signalling. Gummis will mark conspicuous objects with long lasting scent and pheromone smears. These are invisible and nearly odorless to Humans. These marks act as calling cards and advertise a Gummi's social status, condition, and emotional state. Terminology Note: Gummis were first contacted by Americans, and most interaction with their species has been by Americans or people from former American colonies. Hence, the name for their language comes from the way it sounds like Gummis are going "Hoon hoon hoon". The antipodean meaning of "Hooning" never crossed anyone's mind, much as Australians and New Zealanders may be amused by the name. Hooning: Named for the throbbing hums and hollow booms used by Gummis in vocal communication, Hooning is the major language of the Gummi species found in the Verge. Non-Gummis can learn to understand Hooning, but to speak it they need mechanical or electronic assistance to allow them to thrum and whistle at the same time (often with two or three simultaneous whistling and humming tones). While instruments are available to allow non-Gummis to speak Hooning, automatic computer translation is more convenient. Hooning script uses lines to indiciate the pitch and duration of its whistles, and dots, circles, and blobs to specify the proper hum, thrum, or boom. The writing can be oriented in any direction, with the whistle marks on the left and hum blobs on the right when viewed along the temporal direction of the writing. Moongwhii or Sequential: The Gummi trade language, spoken by nearly all Pirang and Tweechi, as well as most Gummis of the Verge. The name translates as "Sequential", and avoids making two or more sounds at the same time. (Consequently, Moongwhii is often called Sequential in the Human-occupied worlds of the Verge). The grammar is taken from Hooning and many of the words are similar … Moongwhii speakers can easily learn (although not always speak) Hooning, and Hooning speakers can quickly pick up and speak Moongwhii. When speaking English, native Hooning speakers apply articles ("the", "a") inconsistently. They know they should be used, but often use the wrong article, put them in the wrong place in the sentence, use an article when none should be used, or drop them when they should be used. They also have trouble with verb tenses. Hooning speakers will tend to indicate when something happened/will happen by including a descriptive time ("future", "past", "tomorrow", "every 300 kiloseconds", etc. ), and otherwise tend to either use the infinitive form of the verb or apply tenses at random. Languages that have classes of nouns (such as gendered nouns in the romance languages, the distinction between "he/she/it" in English, or measure words in Mandarin Chinese) cause confusion to Hooning speakers. They tend to either leave these out or apply the class at random. Sequential uses the same grammar as Hooning, so native Sequential speakers have the same issues. Gummis support themselves with muscular hydrostats - tubes of circumferential muscle around bundles of longitudinal muscle on the inside. Contracting the circumferential muscle tube squeezes the inner muscular core, causing it to elongate as it narrows. Contracting the inner longitudinal muscle has the opposite effect, pulling the ends closer together and making the tube thicker. Contracting the longitudinal muscles only on one side causes the bundle to bend toward that side. Helical muscles can produce twisting and torsion. The muscle bundles act as both force generators and support, taking the role of a vertebrate's skeleton as well as its muscles. This arrangement makes Gummis very stretchy and squishy. They can stretch an already formed pseudopod out to a distance of about two meters, or retract it back into a lump on their body. They can fit through gaps of about two centimeters across, although it takes time to squish through narrow gaps and small holes. A Gummi's equipment, on the other hand, might not be able to squeeze through. It takes a Gummi about a minute to rearrange its zooids so as to form or dissolve an arm or leg (although they can grow and resorb multiple limbs simultaneously). Creating a feeler or digit takes about 10 seconds. Gummis tend to move significantly slower than most other sapient species of the Verge. They are, however, capable of sudden, explosive bursts of stretching, such as a quick pounce or a sudden extension of a pseudopod to grab something. After such a burst, it takes a second or two for the Gummi to retract and re-set the stretched part. A moving Gummi will form several feeler-eyestalks near its forward section and stubby pseudopod legs to lift it off the ground. When moving slowly, the legs will propel the Gummi along with a usual gaited motion. When the Gummi wants to move quickly, however, it will anchor its back end while suddenly stretching its front end forward. Then it will grab on with its front end and draw its rear end towards the front. Suction pads allow a Gummi to stick to nearly any surface. They can move along vertical surfaces and overhangs with ease. Gummis will often carry items around inside of themselves, tucked away in bubbles, voids, or cavities in their bodies. Parent Gummis carry their offspring around in this way, although once they become old enough the parent will leave an opening through which the child can extend sensory pseudopods. Gummis are slightly denser than water, so they sink when swimming rather than float near the surface. Given time to form an internal cavity, however, they can swallow a bubble of air to keep them at the surface. By adjusting making the right size cavity, they can control whether their buoyancy is slightly positive, negative, or neutral by squeezing or relaxing the swallowed bubble. Gummis propell projectiles by spitting them out, forming a sort of air cannon with a tube connected to an air reservoir that is forceably squeezed when the Gummi wants to shoot. In this manner, they can rival the power and precison of a Human's throw, but only for plug-shaped things that can fit tightly in its tube-barrel. Rocks, grenades, balls, and Gummi "drive-darts" can all be spat in this manner, but boomerangs, hatchets, spears, and similar odd-shaped projectiles cannot. Gummis are omnivores. They eat by engulfing food into a void in their bodies. Zooids specialized for secreting digestive enzymes then migrate to this void to begin digestion, other zooids with arrays of tiny teeth start shredding the food, and later zooids specialized for absorbing nutrients take up and distribute the digested remains. In the meantime, muscular contractions mash the food mass to allow digestive juices to do their work faster. When the former food is reduced to a lump of undigestable unnutritious goo, the Gummi squishes it back outside. Gummis will try just about any food item, and enthusiastically adopt dishes from other cultures. While they can engulf food items of even large size, in most cases they prefer the food to be chopped, mashed, pulped, grated, ground, or otherwise mechanically broken down before swallowing. Since encountering Humans, they have become enthusiastic converts to the idea of cooking food; they also borrowed the idea of fermenting food from the Mants, but the extra time involved and tricky nature of getting the fermentation broth just right makes this less convenient. Spices, sauces, and side dishes can all make the dining experience that much more pleasant. Individual zooids reproduce by budding. They use this method to grow sufficient zooids to form a colony that becomes an individual Gummi. Thus, the zooids in the Gummi colony are all clones of each other. To produce a new Gummi, specialized male and female zooids will be produced. Male zooids leave their parent Gummi and seek out reproductive Gummis with an active female zooid, which they impregnate. The pregnant female zooid will grow a larva inside of it. The larva eventually absorbs nearly all of the female before emerging as a new and genetically distinct zooid (only the pregnant zooid is cannibalized in this fashion - the colony as a whole is largely unscathed). The parent Gummi will care for the new zooid and the subsequent emerging colony, providing food, shelter, comfort, education, and socialization in much the fashion of human parents toward their offspring. Severe damage can result in the creation of a different Gummi personality once the zooids have re-organized themselves into a functioning colony. Gummis who are torn into two or more pieces may have each piece grow into a new independent colony of zooids with its own mind and personality. Because there is a strong genetic component to personality, these new individuals will tend to have similar natures to each other and the original much as Human identical twins are often similar. Gummis seek out novelty. They enjoy learning and experiencing new things, and want to know what things are, how they work, and how they relate to each other. New ways of doing things and looking at the world are fascinating to them. There is little emphasis placed on tradition within Gummi communities. This restless curiosity leads many Gummis to becomes explorers or scientists. Gummis enjoy meeting new people. Especially weird new people, like alien species. Or monsters. The more strange and exotic the better. 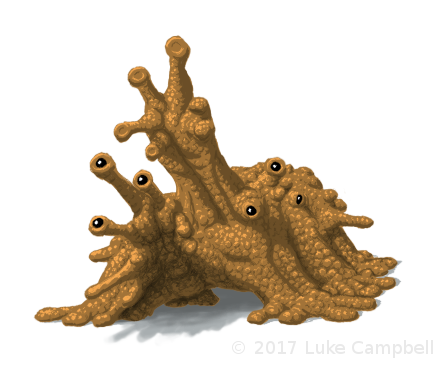 Gummis are reluctant to harm these interesting new potential friends, although they will defend themselves if directly attacked, and make every effort to talk and interact with them. While most Gummis are not disturbed by wide open spaces, they feel most comfortable when squeezed into a tight shelter. When being social or resting but alert, the Gummi will usually have several sensory pseudopod stalks sticking out of its shelter. Human houses tend to be too spacious for them to really relax or unwind - they will crawl into drawers, cupboards, under furniture, inside box-springs, or into vents and conduits in order to rest. Gummis are able to maintain ongoing stable social relationships with a much larger number of people than most other sapients. While Humans can typically know about 150 individuals and track how each known person relates to the others, for Gummis this number reaches into the several thousand, with some Gummis having social netwroks extending to the tens of thousands. It is theoriezed that this increased ability to know others is necessary for the form of their society based on connections and reputation rather than enforced structure and laws. Gummi communities naturally organize by consensus rather than authoritarian power structures. Those individuals with proven experience, expertise, or a history of good ideas command greater respect from their peers, and their suggestions and opinions carry more weight. Their social structures tend to resemble Human communes, with the needs of all being provided for and with everyone expected to help according to their abilities. Anyone who seems lazy, stingy, greedy, or power hungry gets a bad reputation among Gummis, and thus loses influence and respect. Gummi communes tend to number in the several thousand - small enough that each Gummi can know all of the others - although many communes may organize into larger alliances or cities. Despite living in what might seem a communist utopia, Gummis generally respect private property. Those who do not are considered a danger to society, and are hunted down and given mind surgery to correct their criminal tendencies. Gummi architecture eschews straight lines and right angles and uses organic curves and lumps instead. Their buildings are normally made using a domesticated snail-like animal that secretes nacre to make the walls, ceilings and floors of their heaped, mound-like or gourd-like structures. Some Gummis build with other materials as well, such as earth, thatch, adobe, ceramics, concrete, metal, composites, or carboplast - although this will often be cemented over with nacre. Humans cannot fit into Gummi houses, which have twisting tube-halls a few tens of centimeters wide, rounded bedrooms about a meter across into which a Gummi can just barely fit, and larger blister-shaped rooms for socializing that have Gummi-sized alcoves in the walls or jug- or jar-like furniture (the Gummi equivalent of chairs) into which Gummis can squeeze. Gummi houses and buildings often accumulate into large lumpy masses that form the basis of an entire ecosystem. While native life from Gummiland does not require Gummi buildings to form land reefs, when present Gummi architecture can form the basis and foundation of a land reef. Gummi artwork is often as touch- and smell-based as it is visual. The fine sensitivity of Gummi touch means that many forms of Gummi artwork involve making pleasing textures or mimicking evocative touch sensations. This is, unfortunately, a form of artwork that cannot be appreciated by most other sapient beings. Gummi smell compositions are widely admired by most other sapients, with the exception of Humans and Pannovas who do not have very sensitive olfaction. Gummis do not wear clothes, unless environmental conditions demand protective wear. Except for hats. Or at least the Gummi equivalent of hats, which might be more accurately called shells. These are coverings ranging from gently curved plates to cones to full domes to bottle-shaped portable shelters. Gummi hats may be flexible, semi-flexible, ribbed (and foldable or collapsible, like an umbrella, hand fan, or Chinese lantern), or rigid for increased protection. The hat will cover the upper half of the Gummi's body, and the Gummi can clamp the hat down over itself to rest leaving no body part sticking out (or perhaps a few feelers and an eye or two). Bottle-style hats allow the Gummi to withdraw up inside the hat – Gummis walking around with just a few pseudopod legs sticking out of a bottle hat are an amusing sight to Human eyes. Gummis' deep thrums carry long distances, giving their vocals remarkable bass. Their ability to produce several tones at once allows them to sing harmony with themselves, and accomplished Gummi singers can emulate a small orchestra. Gummis use music as a form of group bonding, with communities coming together to sing and pulsate in synchrony. This helps to ease differences and bring the commune into harmony. Gummis also use music as a form of conflict resolution, with two posturing individuals facing off and seeing who can sing the loudest and most skillfully. It helps that singing loudly requires puffing oneself up with lots of air, thus simultaneously increasing one's stature and apparent size. Gummis have a number of sports. Tangling is Gummi wrestling, a strange affair that may involve both parties climbing walls, extended pseudopods bracing off every available surface, and occasionally nothing visible at all when both tanglers take their fight down into some dark burrow. Gummis also enjoy contests of dexterity, including the ever-popular poking. Target squirting is just good fun (non-Gummi observers are advised to bring rain slickers).